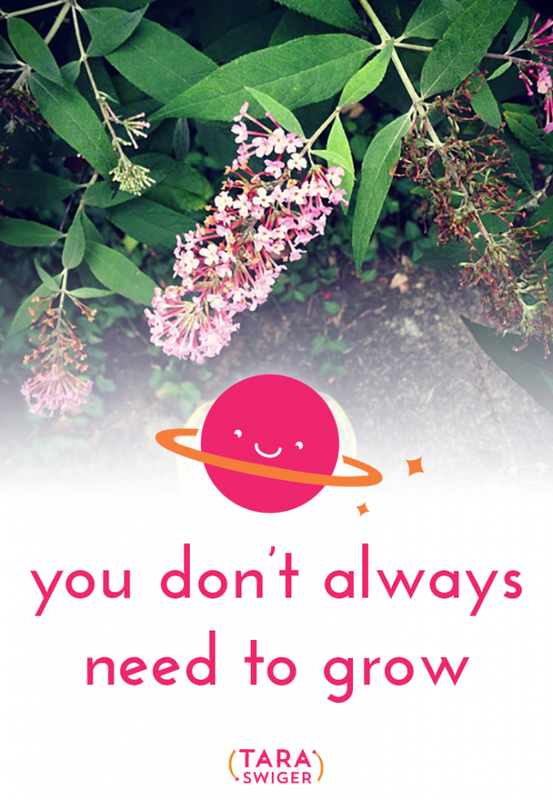 You don’t always need to GROW. Although I'm a fan of (and evangelist for) quarterly map-making (setting a new goal, plotting the course to get there), I don't mean to imply that we'll want to grow every month, end over end, for ever and ever. Most of us are at the place in our business where we want and need regular growth to get to the point of a sustainable, reliable business (and income.) And we know that just waiting around for that growth to happen isn't going to work. We have to plan for it, lay out a path, and do the work to move towards the destination. A lot of times, this looks growth. But even before we get there, before we have that sustainable and nourishing business, every quarter (or month, or day!) isn't about growth or sales or money. Some are for immersing in the work. Some are for flow – finding how we work and operate best. Some are for finishing and shipping. Those months aren't just breaks from growth – they are the catalyst of growth. They are the fertilizer and sunshine and rain. They build the foundation, repair the weak spots and replenish your enthusiasm. Even when you're not setting the intention to grow a metric in your business, you are still growing, as a person, a business owner, a maker. And when you get that sustainable, reliable business (and income) you may still seek growth – in sales or in another metric, like skill growth, project growth, free-time growth. As you set your destination for this quarter, or you review the last one, don't be discouraged. Remember that you're plotting a destination not so that you're always striving, but so that you focus your energy on what you really want, so that you filter out the distractions, so that you find your own path and trust your choices. What's your destination this quarter? 5 Comments on You don’t always need to GROW. Sometimes i feel like you have esp and tell me just what i need to hear when i need to hear it. thank you!!! i was feeling bummed this week about seeming like i have kinda stalled, but actually I have been preparing mentally and physically for a 2 week book tour starting this weekend. it is all about different days for working on different types of things that all add up to a successful whole. thank you!!! Kelly! I’m so glad to hear it spoke to you! Preparing for a book tour is totally movement in the direction you want to go – and that’s what matters! Have fun on your book tour!